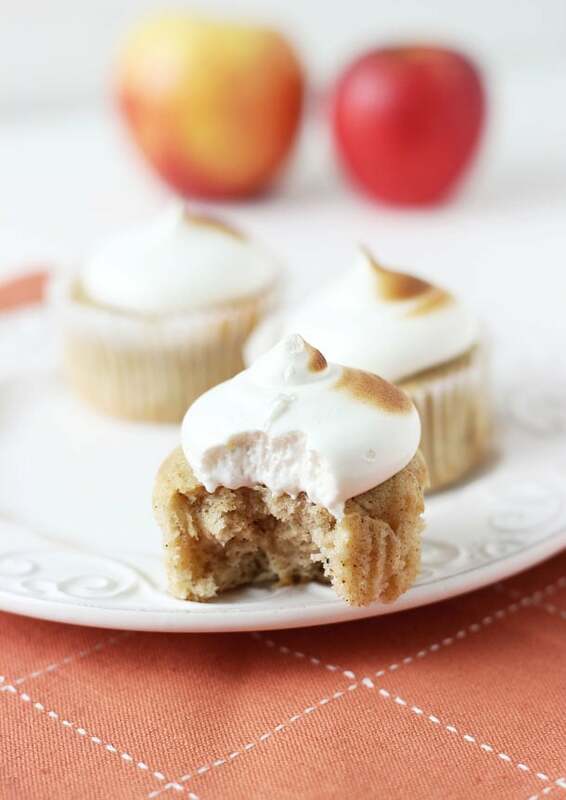 Perfectly spiced apple cupcakes are filled with caramelized apple chunks and topped with a silky, smooth and fluffy maple marshmallow frosting. It’s fall you say? You guys I need to start watching music videos. I love listening to music while baking or in lab as I do my experiment and that’s usually on the iPod or radio and never so on YouTube. To be honest too much naked bodies roaming around for my taste and there isn’t a focus on the music so I enjoy the sound effects. But the other day the boy and I were laying on the couch and he played the video to one of my recent song crushes on the radio and I realized even though I knew who the singer was, I didn’t KNOW he was cute!!! Like seriously hot! Maybe I just need to start watching the right music videos again. OK embarrassing realization over, let’s talk about cupcakes. We are continuing with our apple theme of the week after these caramelized apples with goat cheese crescents from Monday. I present to you the best cupcakes you will have this fall! These spiced apple cupcakes with maple marshmallow frosting are an attempt to recreate the best apple cupcakes I’ve ever had. In the cutest cupcake store in Montreal, we tried a Cronut (weird I know but seriously amazing) and an apple cupcake made with all-natural ingredients (the store owner had to stress the nature of his ingredients). It was truly a delicious cupcake and I couldn’t stop thinking about it a week later and just had to try to remake it. I think I came pretty close to the original (Mr J agrees!) and I’m in love with these. 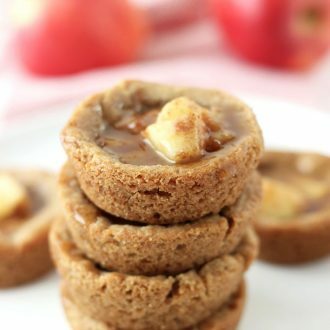 The cupcakes are perfectly spiced, soft and filled with caramelized apples. Yes I’m obsessed with caramelized apples in brown sugar these days. Just do it and you will see why. The frosting here is light, not too sweet and fluffy. Just a simple maple marshmallow frosting to take the cupcakes to the next level. These will become your new best friend for fall! I promise. 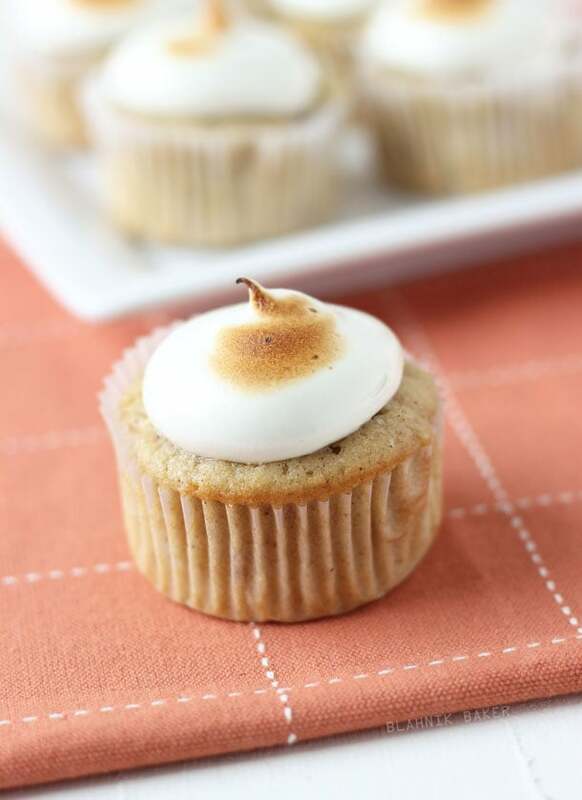 Perfectly spiced apple cupcakes are filled with caramelized apple chunks and topped with a silky, smooth and fluffy maple marshmallow frosting. It's fall you say? Preheat oven to 350 degrees F. Line 2 standard muffin tins with cupcake liners. In a medium saucepan, combine the apples and brown sugar. Cook over medium heat until apples are soft and caramelized. Set aside to cool. In a medium bowl, whisk together flour, baking powder, baking soda, salt, ginger, cinnamon, nutmeg and cloves. In the bowl of an electric mixer, beat butter and sugar on medium speed until light and fluffy, about 3-5 minutes. Add in egg and mix until combined. Add ⅓ of the flour mixture and mix until just combined. Add half of the milk and mix. Add ½ of the remaining flour, then the rest of the milk and the rest of the flour, beating well after each addition. Using a rubber spatula, fold in the caramelized apples into the batter until well combined. Divide the batter into the prepared cups, filling each ⅔ of the way. Bake cupcakes until the center springs back when touched, about 20-25 minutes. Remove from pan immediately and let cool completely before icing. In the bowl of an electric mixer, whip the egg whites until soft peaks form. In the meantime, in a small saucepan set over medium heat, heat the sugar, corn syrup and maple syrup until the mixture comes to a full boil. Remove from heat. With the mixer going, slowly pour the hot sugar mixture into the stiff egg whites. 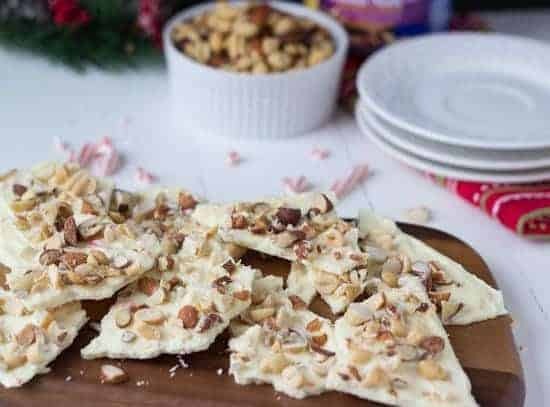 (Do not scrape the sides of the bowl or sugar crystals will form in your frosting. Trust me!) 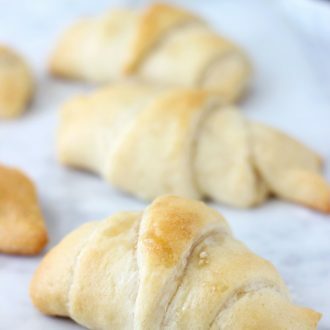 Beat the frosting until it’s shiny and fluffy, about 5-7 minutes. Pipe the frosting onto cooled cupcakes. Use a kitchen torch to toast the frosting slightly. 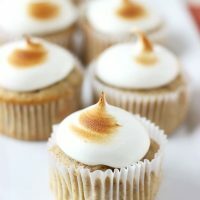 I love these cupcakes Zainab..and that torched marshmallow frosting looks perfect on top! Maple Marshmallow Frosting! Good gracious I am swooning. LOVE!! These look sooo amazing Zainab!! Alice the cronut was freaking amazing!! It’s splendid!! Couldn’t love these more! Everything about them! Marshmallow, maple, apples… all of it! Okay, you *have* to tell us who the hottie was, btw!! Enough suspense!! I tried to comment on this earlier and couldn’t. I’m glad whatever the problem was – probably on my side – cleared up!! I have a music video for you! All About That Bass. So good!!! Plus, if you haven’t seen the Fancy video (by Iggy Azalea) then you need to go and do that right now. If you don’t already love the song, it will make you love it!! So sorry Liz for that. It seems as if a few people had some troubles. Technical stuff and I just don’t get along. I just watched that video. In love. I had no idea Iggt Azalea was blond lol! These cupcakes sound like the best thing ever! 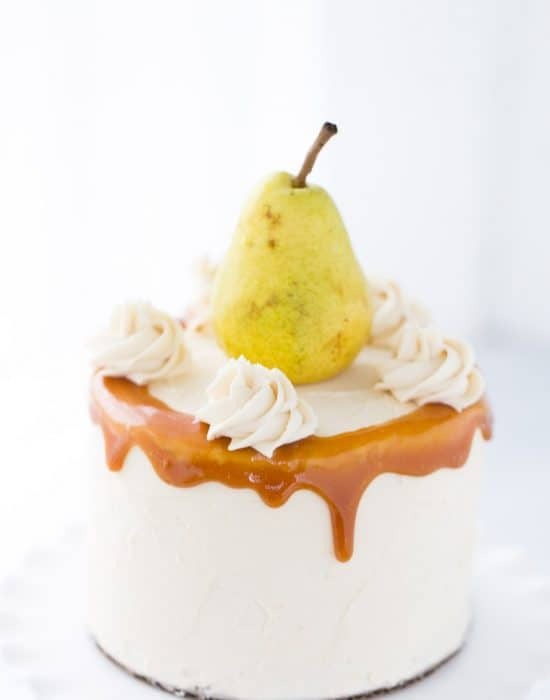 I am obsessed with caramelized apples and with maple marshmallow frosting??? Genius!!! Pinned! Oh my gosh Kelly I’m loving caramelized apples too. I have no idea why I didn’t make my apples like this before. Haha, OMG that is the BEST! I could probably sing you every Top 40 pop song right now but I would be hard pressed to pick a pop star out of a lineup (excluding like, T. Swift :). 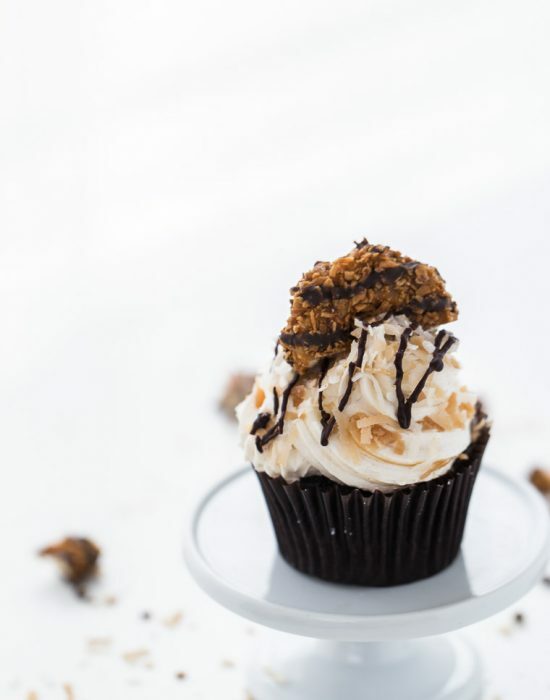 These cupcakes are calling my name in a major way! I know right? I can sing them all but have no idea who the singers are! My 13-year old niece schools me all the time. Oh wow, happy fall indeed! 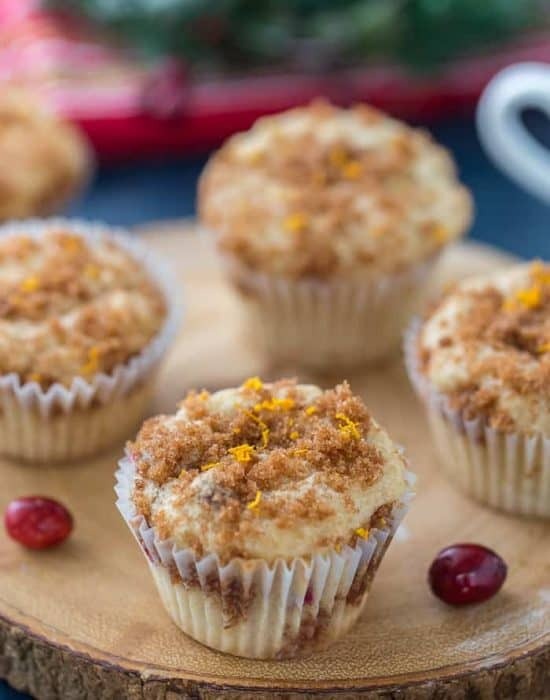 These cupcakes look amazing, and I love all the warming spices! Zainab, these look AWESOME!!! Love the flavor combo! I need to get a torch asap! Loving the toast on the frosting Zainab! I’m often shocked when I catch a music video here or there — the singers look so different than I expected! Sometimes the videos ruin a song for me, so it can be quite the opposite of your encounter. 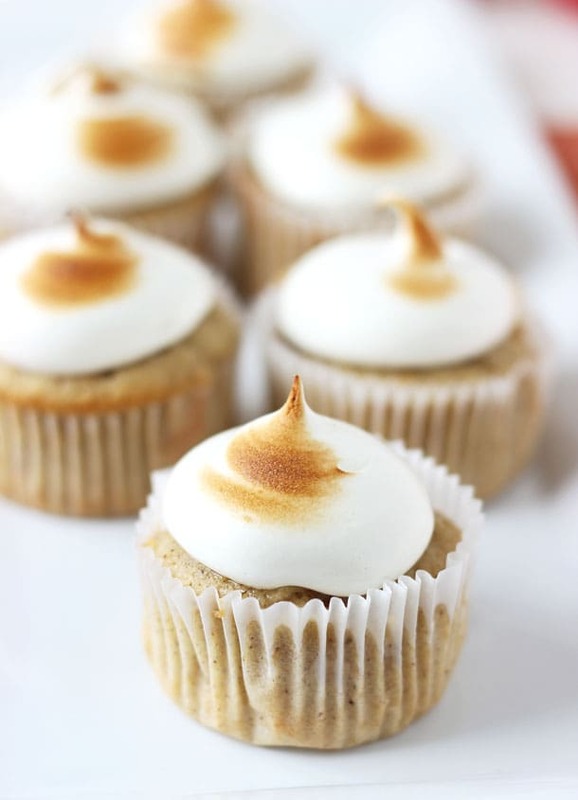 haha These cupcakes scream fall, and that marshmallow frosting looks divine! Marcie so true. That’s why I stay away from them they sometimes ruin the songs. Totally cracking up at your music video comment. I have to know-who is the singer?? I am low on celebrity crushes right now and in the market, lol. Hahha Erin it’s Luke Bryant, the country singer. Crush along with me please. His touchie is fineeee!! So in love with this flavor combination! Such a huge fan of that frosting! Marshmallow and maple, amazing! These look amazing! Is there a substitute for the white granulated sugar–brown perhaps? Do you think if I used almond flour vs all purpose they would turn out OK? Oh wow, these look absolutely decadent! I wanna stuff my face with all of that frosting and apple spice… isn’t it just the best this time of year?! It is the best time indeed!! Thanks Connie! Zainab … these are one of the most beautiful things I have seen all day! Absolutely stunning! I love the idea of a fluff marshmallow frosting. Something I would love to try. I watch NO music videos unless they make it into the news. I think the last I watched was Miley Cyrus’s Wrecking Ball…and then was traumatized for life. That maple marshmallow frosting paired with apple cupcake deliciousness is just GENIUS. GENIUS I tell you! Yeah that one was BAD!!!! Hahah it’s Luke Bryan’s play it again. I don’t watch music videos either, and for the same reason! These cupcakes sound amazing. I love apple cake/cupcakes! Love that frosting! I’d want to smother that on pretty much anything and everything!! I’ve been doing that exactly!! Thanks Chris!! And wow, when someone else says its almost spot on, you know you it is a good recipe. That frosting sounds incredible! Fantastic job, pinning! I LOVE watching music videos. I go back and watch all of the 90s alternative stuff I was (and still am) into from my middle and high school days. OH, and Weird Al videos are pretty fun to watch, too! I bet these smelled wonderful! Homemade marshmallow frosting is my favorite thing on earth. I know it would pair perfectly with these cupcakes. It’s so fluffy and freaking addicting!!! I love your apple recipes! These look delicious, and that frosting is awesome. So pretty! I never watch music videos either, your discovery is great!! Haha!